In this beautiful jar, Dora has fired it in an oxygen rich atmosphere, which makes the red stand out. She has used a micaceous slip on the jar itself. A bear symbol is featured in the center. 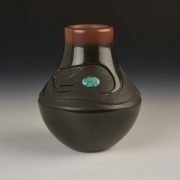 All of this is surrounded by fine shell heishi, and turquoise and coral beads inlaid in the margin of the black circle. The sculpted clay lid is another form of the bear symbol. It is wonderfully polished. In Pueblo tradition, the bear was sent to lead the Pueblo people to the Rio Grande Valley and its abundant agricultural productivity. Dora Tse-Pe, was born at Zia Pueblo in 1939. Dora learned pottery as a child from her mother, Candelaria Gachupin, gathering clay and sand and basalt. When Dora married and moved to San Ildefonso Pueblo, she knew how to make pottery, but she watched Rose Gonzales, her new mother-in-law, make red and black pottery. “We didn’t polish at Zia,” says Dora, who helped Rose gather clay and fuel for fire. Dora told me she was also inspired by Popovi Da, and his son, Tony Da. 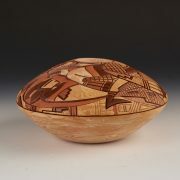 Dora is known not only for her coiling skills, and carving techniques, but her polishing has always been exemplary. She has always been a perfectionist with her vessels. She achieves a beautifully smooth burnish and an exceptional black and red firing to her pottery. 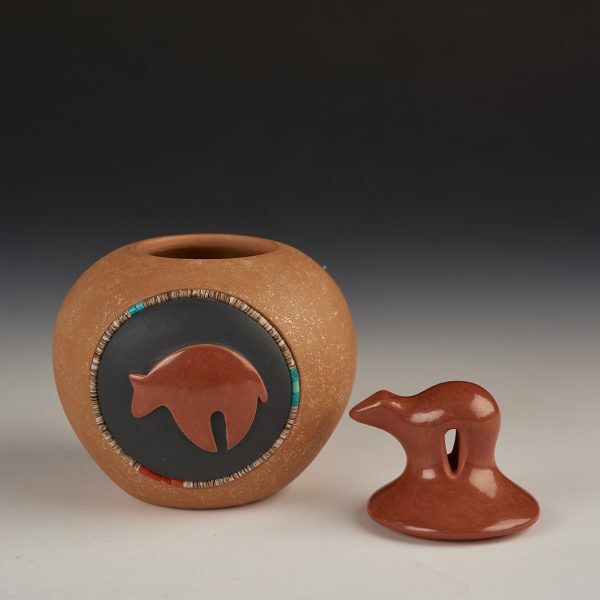 She has been able to balance traditional methods with innovative combinations of textures, colors, and clays. Dora has received much recognition for her work. The first prize she ever won was a blue ribbon at the 1969 New Mexico State Fair in Albuquerque for a simple, plain black pot that she had polished and fired with Rose Gonzales. 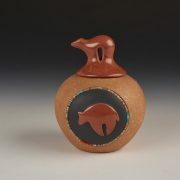 In 1988 and 1991 she won the prestigious Best in Traditional Pottery award at Indian Market in Santa Fe. I have worked with Dora for over twenty years, and it has been a joy to know her.